Understanding urban air pollution and the impact it has on human health is fundamental to city government and planning. Traditional monitoring methods lack temporal and spatial resolution, which has created the need for complementary monitors such as the ones made by Aeroqual. The Shaoxing EPA used the Dust Sentry to build its town-level PM2.5 monitoring network to comply with China’s new air quality monitoring regulation. The project has brought together several organisations: SC AQMD with a STAR grant from U.S. EPA & Aeroqual, as part of a government-funded research programme led by the University of Auckland in NZ. What is urban air pollution? Urban air pollution is a complex mix of gases and particulate matter that negatively affect communities living in and around urban areas. It’s most recognisable by that thick brown haze which blankets cities across the world, especially in summer, known as photochemical smog. Nitrogen dioxide, ground-level ozone and particulate matter are the three main air pollutants in modern cities and the health effects of these are well-documented. These three, as well as carbon monoxide and sulfur dioxide, are known as ‘criteria pollutants’. Criteria pollutants are included in national air quality standards that define allowable concentrations of pollutants in ambient air. Inhalation of nitrogen dioxide (NO2) can impair lung function and increase susceptibility to infection, particularly in children. It can also aggravate asthma. NO2 is not only a toxic gas but it is also a precursor to several harmful secondary air pollutants such as ozone and particulate matter. It also plays a role in the formation of acid rain and photochemical smog. In the upper atmosphere ‘good’ ozone (O3) protects life on Earth from the sun’s ultraviolet rays. At ground level ‘bad’ ozone is a criteria pollutant that is a significant health risk, especially for people with asthma. It also damages crops, trees and other vegetation and is a main component of smog. In 2013, the World Health Organisation (WHO) classified particulate matter (PM) as carcinogenic to humans, responsible for the deaths of 3.7 million people worldwide per year. PM10 (particles ≤ 10 microns) is a criteria pollutant and is a serious health risk because PM10 particles can penetrate the lungs. PM2.5 (particles ≤ 2.5 microns) is also a criteria pollutant which has even greater health impact due to risk of penetration deeper into the respiratory system. Research has linked particulate pollution to lung and heart disease, strokes, cancer, and reproductive harm. Why measure carbon monoxide and sulfur dioxide? Carbon monoxide (CO) is a toxic, odorless gas. If inhaled it will displace oxygen from the hemoglobin molecule in our blood and lead to severe disability or even death. Sulfur dioxide (SO2) is a toxic gas with a strong irritating smell. Inhaling sulfur dioxide has been associated with respiratory disease and difficulty breathing. It is also a precursor to acid rain and atmospheric particulates. Where does urban air pollution come from? The major source of nitrogen dioxide (NO2) in urban environments is the burning of fossil fuels. In urban areas this is most commonly associated with motor vehicle exhaust. Areas with high density road networks close to large populations such as in towns and cities are most at risk of over exposure. Industrial sites will also produce high concentrations of NO2. These include any industry that use combustion processes such as power plants, electric utilities and industrial boilers. 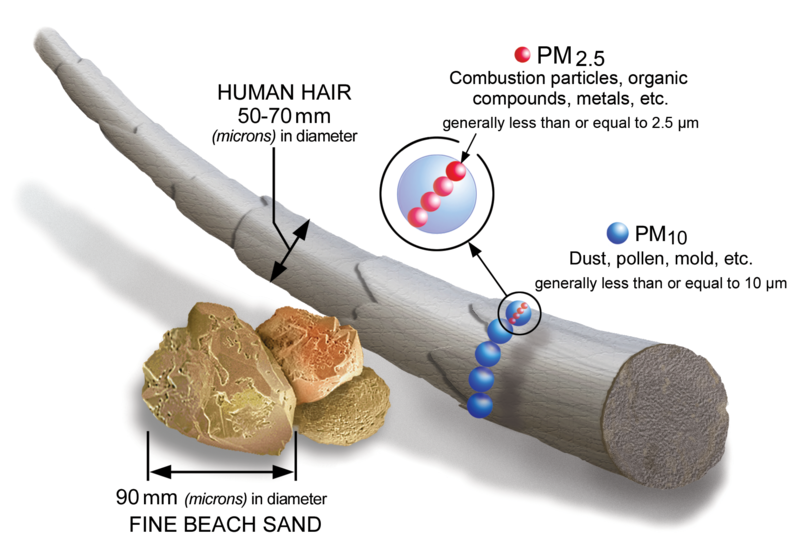 Airborne particulate matter (PM) is categorized into different size fractions. Total Suspended Particulate (TSP) includes all particle sizes and is a good measure of nuisance dust. The key sources of PM10 and PM2.5 are from human activities – vehicle emissions, burning fuels like diesel and coal, and industrial activities. Ozone is not emitted directly, rather it is typically formed through complicated photochemical reactions, involving nitrogen oxides (NOx) and volatile organic compounds (VOC), both typically emitted from vehicles and industrial sources. As temperature increases on say a hot summer’s afternoon, the efficiency of this reaction increases, and more ozone is formed. The main source of outdoor CO is combustion processes from transportation and industrial activity. Fossil fuel combustion at power plants is the largest emission source of SO2 into the atmosphere. Other sources include extracting metal from ore and the burning of high sulfur containing fuels by ships, trains and machinery. However, in recent years SO2 as an urban air pollutant has been declining due to the desulfurization of fuel. How is urban air pollution measured? How does Aeroqual measure urban air pollution? Customers can use our equipment to extend their air quality monitoring network or ‘fill in the gaps’. A single AQM65 or AQS1 can be used to scout sites for locating future reference stations and can be deployed on a short term basis in response to public complaints, to capture events or for seasonal studies. The AQS1 and AQY can be deployed in high density across a city, giving a much richer picture than was previously possible. We also offer handheld portable monitors for providing indicative air quality information on the move. For air quality compliance at remediation and landfill sites, the AQS 1 measures particulate matter (TSP, PM10 & PM2.5), volatile organic compounds (VOCs), and optional nitrogen dioxide (NO2). Easy-to-use air quality testing kit with everything required to get started measuring key outdoor pollutants. Includes the Series 500 portable monitor with PM (PM2.5/PM10), NO2 & O3 sensors.